Here’s a sentence we might see routinely this season as the World Cup distance races transpire. Norway’s Therese Johaug wins again! 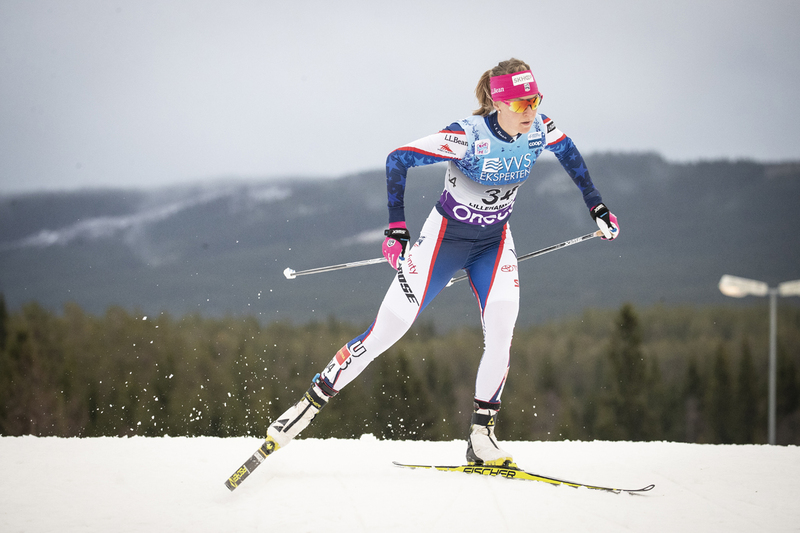 In Sunday’s 10-kilometer classic pursuit race in Lillehammer, Norway, Johaug set an unmatched pace to win her second race of the weekend and the overall in Lillehammer’s three-race series. Sweden’s Charlotte Kalla lead off the race, starting a spartan two and a half seconds ahead of Johaug. Kalla led the first lap, with Johaug tight on her heels. On the first major climb, which kicks about 3 k into the 5 k loop, it appeared Johaug was struggling with her kick wax. With slight micro-adjustments when firing the muscles, if there was any kick-wax deficit, it did not slow her down. 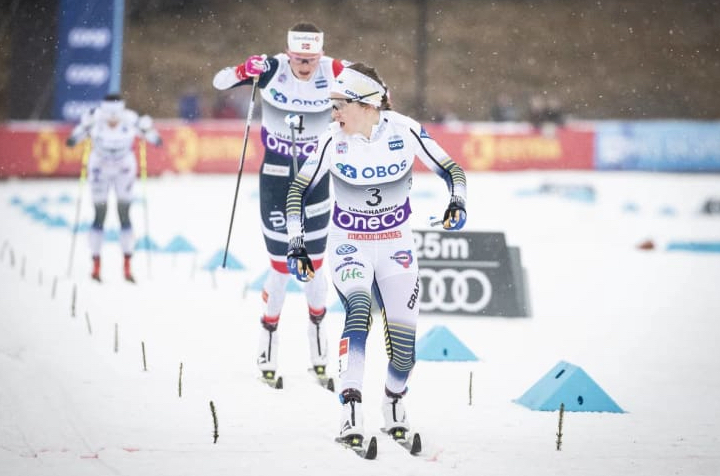 Kalla and Johaug skied through the first lap mark together. Soon thereafter, Johaug tightened her grip on the win by stretching the time back to a just-hanging-on Kalla. By 7.2 k, Kalla had bled 15.7 seconds to Johaug. 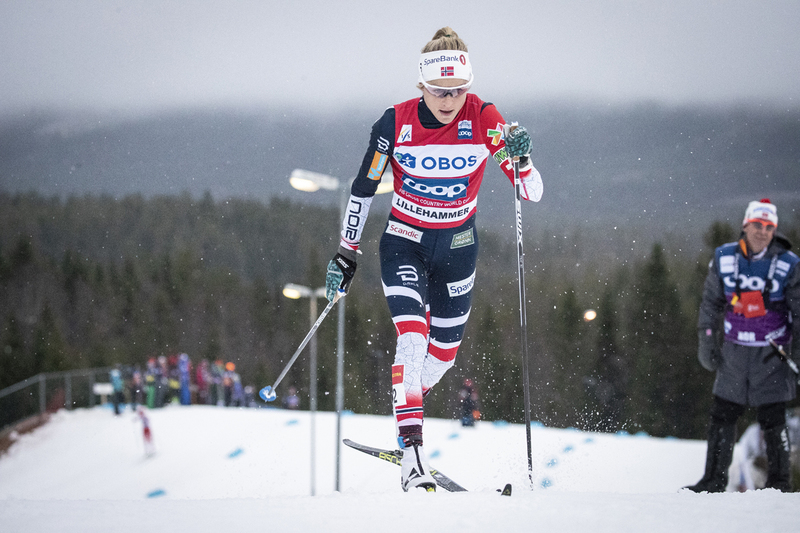 Johaug continued her unrelenting pace throughout the second lap. Kalla continued to lose time whereas Kalla’s teammate, Ebba Andersson, who began the race 14 seconds back, began to make ground on Kalla. Andersson was able to close the gap between Kalla and herself between the 7.3 k and 8.3 k mark. By 8.3 k, Andersson had put a 6.4 seconds buffer between herself and Kalla. Behind Kalla, Norway’s Ingvild Flugstad Østberg kept the third podium step within her sights. On the last climb before the finish, Østberg caught and passed Kalla and began gaining time on Andersson. Johaug won in a time of 29:25.5 minutes. Andersson and Østberg finished neck-and-neck, with the Swede taking second (+16.8), and Østberg third, only 1.1 seconds back. Kalla finished fourth (+23.1). After this weekend of racing, Johaug sits first overall in World Cup standings with 400 points. Andersson is in second, 91 points back, Kalla is positioned third, with 298 points. Sadie Bjornsen of the U.S. Ski Team, after a strong start to the season, is eighth overall on the World Cup. On Sunday, Bjornsen was one of three U.S. women in the top-15. Bjornsen started Sunday’s pursuit in 7th and finished in 10th with a time of 31:57.2 minutes. Staring 50 seconds back, Bjornsen lost time on course to the leaders. She ultimately finished 2:21.7 minutes behind the winner, Johaug. 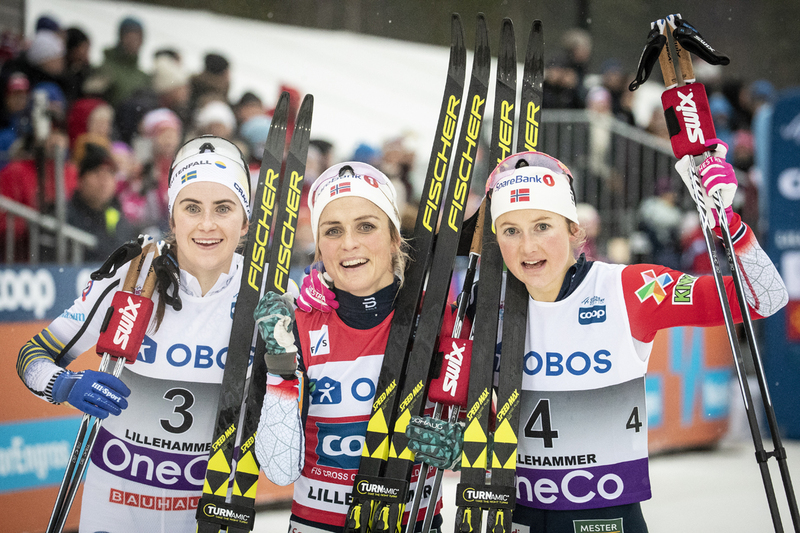 “It was definitely a tough race out there, I had pretty slick skis, so it was just a matter of trying to stay positive and herringbone as much as I could and it was definitely a difficult course to be struggling on,” Bjornsen told FasterSkier in the Lillehammer mixed zone. Bjornsen had intended to link up with the skiers beginning ahead of her. But the tough conditions foiled her strategy. Rosie Brennan (APU) and Jessie Diggins (USST) began Sunday’s race in 13th and 14th respectively, 1:25 minutes behind Kalla. The U.S. pair was able to ski together for the majority of the race in a pack with Norway’s Heidi Weng, and Russia’s Yulia Belorukova. By the finish, Diggins was able to gain one place to end up 13th (+2:42.4). Brennan lost three places in the finishing stretch to take 15th (+2:46.0). Brennan has started her season off strong with a career-best 11th place in Saturday’s 10k classic individual start, she finished 11th. Whitcomb noted Brennan’s marked improvement and return to form after her struggles with an illness last season. Caitlin Patterson (Craftsbury Green Racing Project) started in 31st, 2:37 minutes behind Kalla and finished 35th, five and a half minutes behind Johaug. Throughout the race, she hovered between 27th and 32nd place, but she crashed on a downhill during her second lap and lost places. “I was crushing it on the downhills until then and I consider myself pretty good at cornering, but I just momentarily caught a glimpse of a two girl in front of me, got too excited, lost focus, and stepped in some slush that I wasn’t expecting or something,” Patterson told FasterSkier after the race. Racing continues on the World Cup next weekend with events in Beitostolen, Norway.